NORTH ATTLEBORO, Mass. 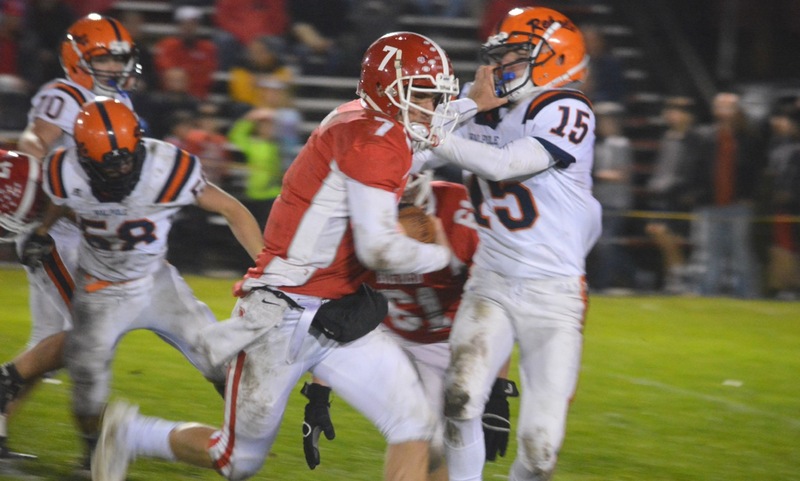 – Not many teams have been able to slow down North Attleboro’s offense this season, and not many squads have been able to solve Big Red’s defense. You can add Duxbury to both lists. 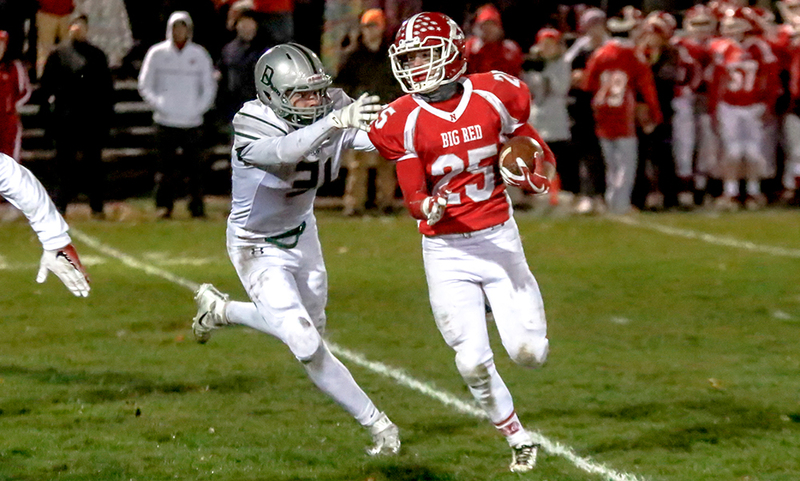 The top-seeded red hot Rocketeers cruised to a D3 Sectional title, routing the second-seeded Dragons, 35-0, under the lights at Community Field. 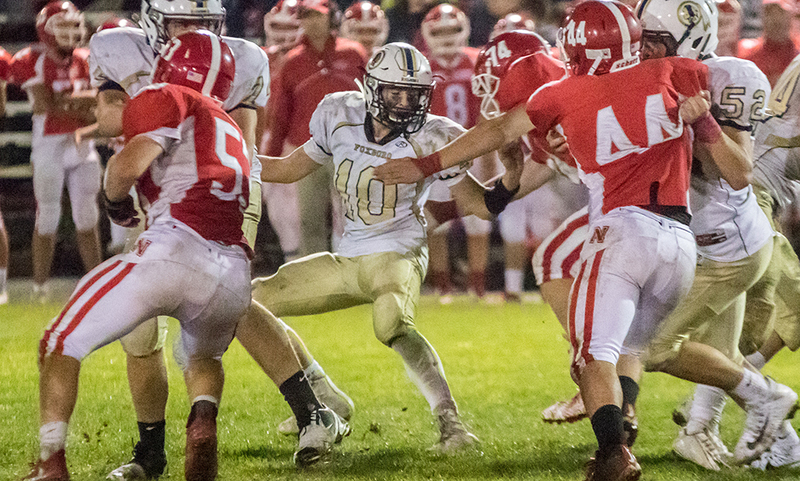 It was the third straight year the programs met in the postseason, with Duxbury prevailing in the previous two contests including last year’s sectional final. North Attleboro advances to the D3 State Semifinal and will play the D3 North sectional champion, which will be decided on Saturday afternoon between Lynn English and Tewksbury. Big Red wasted little time imposing its will on the offensive side of the ball, taking the opening kickoff and marching 55 yards on 12 plays — all rushing plays — to take an early lead. Brendan McHugh (10 carries, 47 yards, two touchdowns) took his fifth carry of the drive in from three yards out and Geoff Wilson’s extra point put North up 7-0 with 4:04 left in the first quarter. Duxbury’s offense — which averaged 30 points per game coming into the contest — looked like it was primed to respond, possibly setting up a shootout between the two sides. 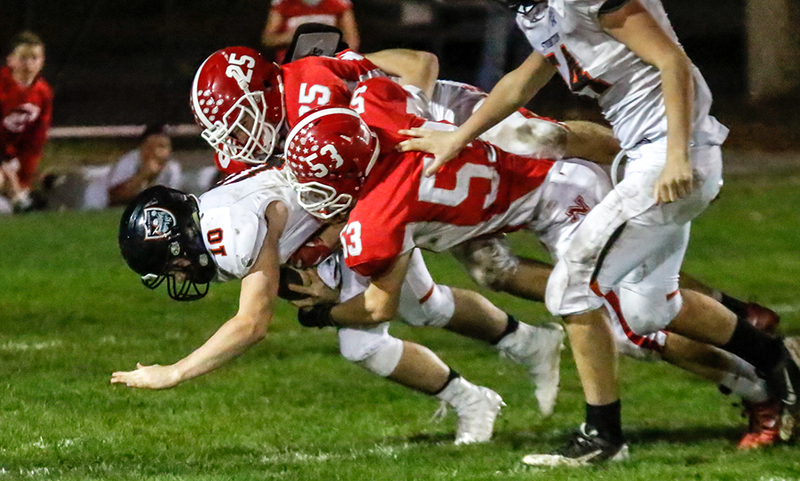 But after moving into North territory, the Dragons saw what could have been a touchdown dropped over the middle, and then a fourth down passing attempt ruled incomplete on the sidelines. After focusing on the run on its first drive, North shifted to its pass game as Chad Peterson (6-for-7, 98 yards, touchdown) hit Mario Bresko deep for a 46-yard gain on the second play of the drive. Two plays later, Peterson hit Jonathan James in the flat and the junior charged his way in for an 11-yard score and a 14-0 lead with 13 seconds left in the first quarter. Once again, Duxbury’s offense moved the ball, this time with a 53-yard drive to get into the red zone. 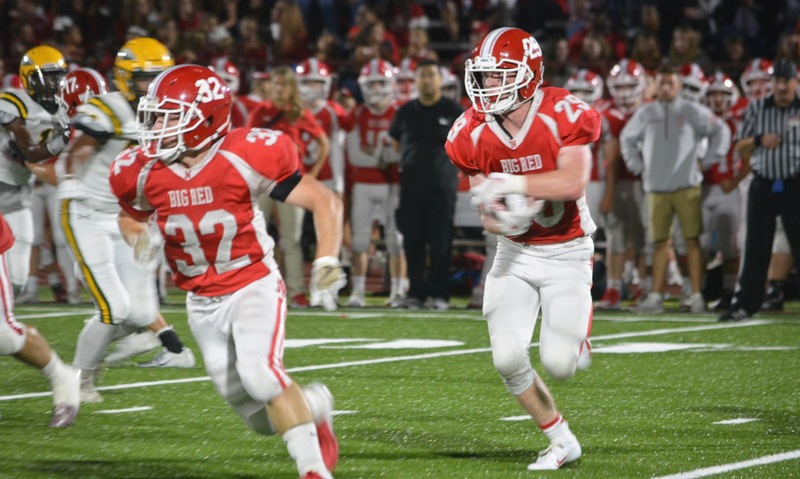 But on the 15th play of the drive, Dragons quarterback John Roberts attempted to throw into the end zone, but Bresko stepped in front of the receiver for the interception and touchback. Between lengthy drives, North’s third drive of the game stalled in enemy territory and had to punt just as time expired in the first half. North’s defense had one of its biggest stops of the game to open the second half, forcing the Dragons to go three and out and get the ball back. The offense didn’t skip a beat though, rattling off its second-longest drive of the game to begin the second half. Peterson completed passes to Bresko and Devin Slaney on the drive and converted a third down with his legs. McHugh converted a fourth and short down, and three plays later, got into the end zone on a second effort to make it 21-0. 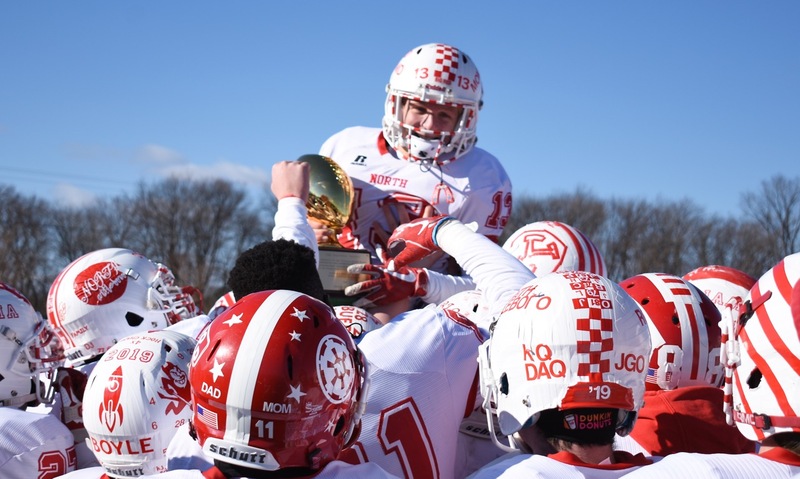 As if that sequence – a quick three and out from Duxbury and lengthy touchdown drive from North – didn’t put North in complete control, the next sequence did. 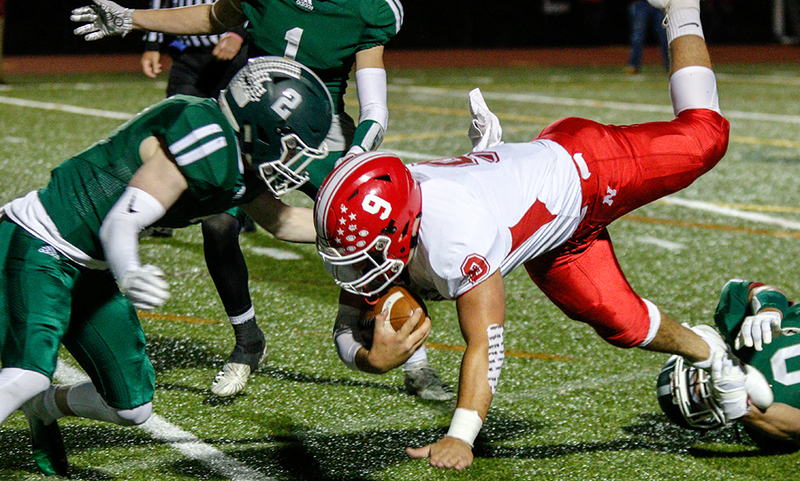 On the first play of Duxbury’s ensuing drive, Roberts dropped back to pass in shotgun and fired a quick pass to his left, but North Attleboro senior linebacker Zach DeMattio stepped right in front and galloped his way for an 18-yard interception return. “Coach Johnson has been talking all week about how us linebackers have been struggling against the past the last couple of weeks so we really had to insert ourselves into the pass coverage,” DeMattio said. “We knew that play was coming so I just turned open and he threw it and I took it. Duxbury picked a first down on its next drive, but then went four straight plays without positive yardage and turned it over on downs. 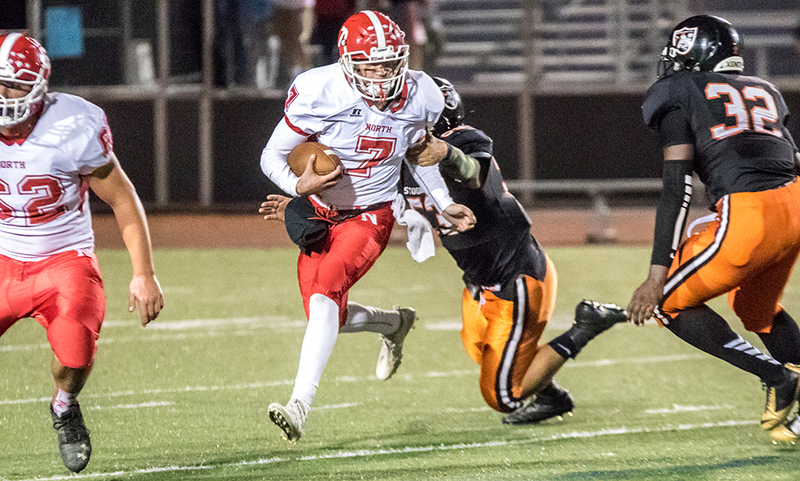 On the first play of the fourth quarter, Nick Raneri took over at quarterback, used an option play and raced his way up the middle for an 18-yard touchdown and a 35-0 lead. 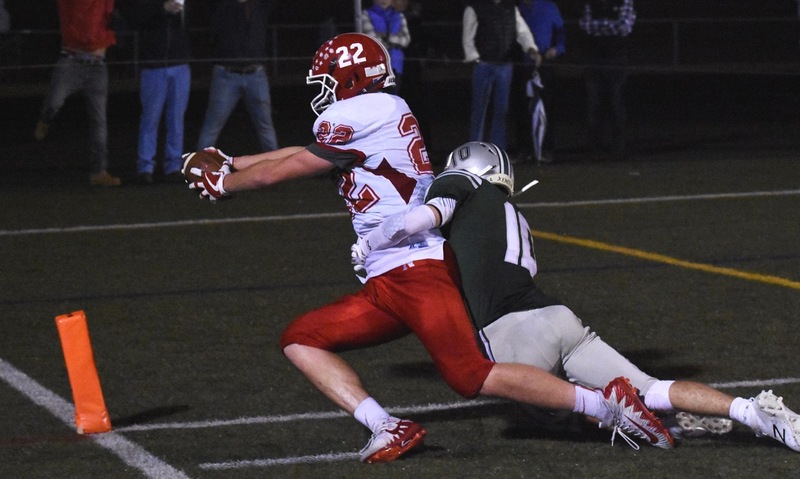 Duxbury once again turned it over on downs and North Attleboro’s reserves, led by Luke Labonte (five carries, 33 yards), ran the rest of the clock off. 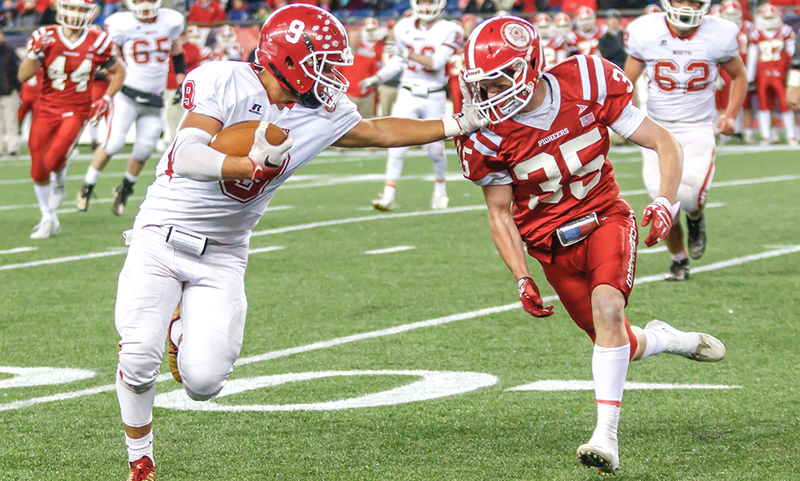 North Attleboro football (9-1) will find out its opponent for the D3 State Semifinal on Saturday. Lynn English and Tewksbury kickoff at 2:00PM.